Pain Physicians NY (Brooklyn & NYC) provides a full range of Epidural Steroid Injections (Caudal Epidural Steroid Injections) as well as advanced pain management services including electrical nerve stimulation for chronic pain among latest cutting edge procedures: Stem Cell Therapy, Body Composition Analysis, High Tech Shockwave Therapy, groundbreaking Interstitial Laser Therapy. Sciatica or other back pain problems including Lumbar Spinal Stenosis and Cervical Spinal Stenosis. This particular procedure involves injecting an anti-inflammatory steroid into the base of the spine through the sacral hiatus area. This is the part right above the buttocks where the spinal cord ends and feels like a bridge. 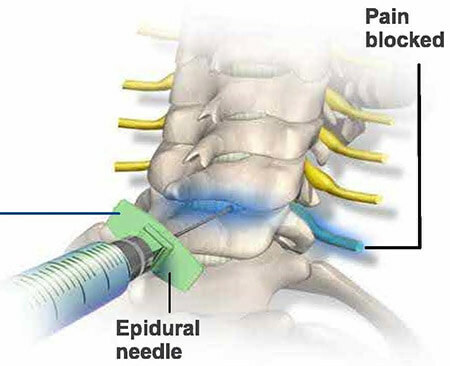 How is the caudal epidural steroid injection performed? The whole procedure is done in the outpatient section of the hospital, meaning that you may be able to resume activities soon afterwards, perhaps even a day later. In addition, you won’t need general anaesthesia, because it’s not an intrusive operation, so you will be awake the whole time. Chances are there will be a blood pressure cuff placed on the arm as well as a heart rate and oxygen monitor. These are sometimes not needed because the patient is awake but the doctor may insist on it just to keep track of your vital signals throughout the procedure. The patient is then requested to lie with their face down, and then a pillow may be placed under the stomach to elevate the sacral region. Sometimes, however, the patient may be laid on their side with their knees drawn in. The first injection contains a local anesthesia which numbs the area, and it is injected just under the skin. Its purpose is to numb the skin and make the main injection less painful. After this, the main needle is carefully inserted through the sacral hiatus area and into the caudal epidural space where the nerves are located. The syringe at this step only contains dye, which enhances the contrast and clearly marks the intended area. At this step, live X-ray through a system known as fluoroscopy is used to guide the doctor on the location of the needle and spine. The dye will be visible in the X-ray and once determined to be in its correct place the syringe is unscrewed, leaving the needle in the epidural space. A single needle is used in the last two injections to avoid double injections and chances of missing the intended area. A second syringe is then screwed on, this one containing the anti-inflammatory steroid, whose function is to reduce the inflammation. This part usually takes about 5 minutes as the steroid calms down the irritated nerve roots, providing relief of the pain. Immediately afterwards, the patient can lie on their back although it is advised to do so on your side, and a bandage is placed. For the next 24 hours, you should avoid physical activities. These injections are effective in about 50% of the patients. If there is just a little bit relief, one or two more caudal epidural steroid injections may be recommended. However, if no relieve is provided with the first injection, there is a big chance that further injections will also provide no relieve, so they are not recommended. Complications with caudal epidural steroid injection procedures are rare since the procedure is fairly common and not intrusive. There have been cases of bleeding, though, which is why patients are advised to stay away from blood thinning medications like an aspirin a few days before the procedure. Other risks and complications following the procedure include allergic reaction to the medication used, infections, neurologic injury if the needle touches the spinal cord, etc. Pain Physicians NY (Brooklyn & NYC) provides a full range of advanced pain management services to help our patients return to a healthy and pain-free lifestyle. Our approach to pain care in Brooklyn is individualized, and we providing the most effective treatments and utilizing the latest technologies available in USA. The pace at which technology is growing can make last year’s methods obsolete. Our team is always at the top of their game and at the head of the pack.